I am firmly in the constructivist camp—with strong leanings toward connectivism. As I investigated ISTE Standards 2, 3, and 6, I found myself searching for resources to help my students become independent, while also social, learners. My school had recently adopted software that would allow for document sharing of the sort that would streamline this process: Google Apps for Education (GAFE). My classroom is the pilot for this platform and so I decided to use the document sharing & commenting features to enhance the peer editing process in my writing curriculum. My goal was to increase the quality of my students’ peer editing practice through creating a system of accountability—I would be able to view their comments on each other’s work in a way that would have been unmanageable in the former paper-based system. This is just a beginning. The true goal is to increase my students’ value of peer editing through enhancing their experience—creating a learning environment that fosters constructive commenting that result in meaningful revisions to their writing. In a constructivist learning environment, “The main purpose of a teacher appears to be to provide the initial learning environment and context that brings learners together, and to help learners construct their own personal learning environments that enable them to connect to ‘successful’ networks, with the assumption that learning will automatically occur as a result, through exposure to the flow of information and the individual’s autonomous reflection on its meaning” (Bates). The improvements to our writing practice as a result of document sharing and commenting features create a more dynamic classroom peer editing environment, with increased social discourse (networking) among students about writing. My students are used to accessing information online; however, their preferred method for storing found information is “bookmarking it” – using the bookmark feature of their web browser – or – gasp – simply “leaving the tabs open” until they are done with a project. The students who use the “more advanced” bookmark method usually do not know how to save a link beyond the bookmarks bar (i.e. creating new bookmark folders). My 8th grade writing curriculum is dominated by a “seminar project”—essentially, an inquiry-based expository research paper—for which students use the Big 6 process to develop an essential question, perform independent research, synthesize their research into a 5-7 page expository essay, and then reconfigure their essay into a presentation format. For the last few years, I had been introducing my students to a combination of Diigo + Easybib for resource management (banking, annotation and citation). During my research for ISTE Student Standard 3, I discovered a new platform, Imagine Easy Scholar —launched in July 2015 (debuted at ISTE 2015)—which combines the resource banking, annotation and citation features. According to constructivist theory, “The level of teacher guidance can vary… from none at all, to providing some guidelines on how to solve the problem, to directing students to possible sources of information that may be relevant to solving that problem, to getting students to brainstorm particular solutions” (Bates). The Scholar platform is a “teacher initiated and controlled” environment. I worry that my 8th graders won’t be able to develop independence in selecting and using information management tools, which is one of the goals of the seminar project—and a skill that I hope to help them acquire as they go on to high school and beyond. I need to think about this more before making a change. My current resource selections for ISTE Student Standard 6 are a variety of tutorials and help menus for the platforms my students use in their daily interactions with technology. Rather than consolidating these resources for them; however, I want to teach them how to find them—to identify them as a critical resource—so that they can be more independent in their learning of new technologies. Figuring out how to do that in a way that is engaging and makes sense for middle school students will be the true answer to my question. Connectivist theory tells us that “we have other ways to record and transmit knowledge that can be studied and reflected upon, such as video, audio, animations, and graphics, and the Internet does expand enormously the speed and range by which these representations of knowledge can be transmitted” (Bates). Therefore, future-ready learners need to be able to locate resources that will help them to independently master new skills, including new technologies. 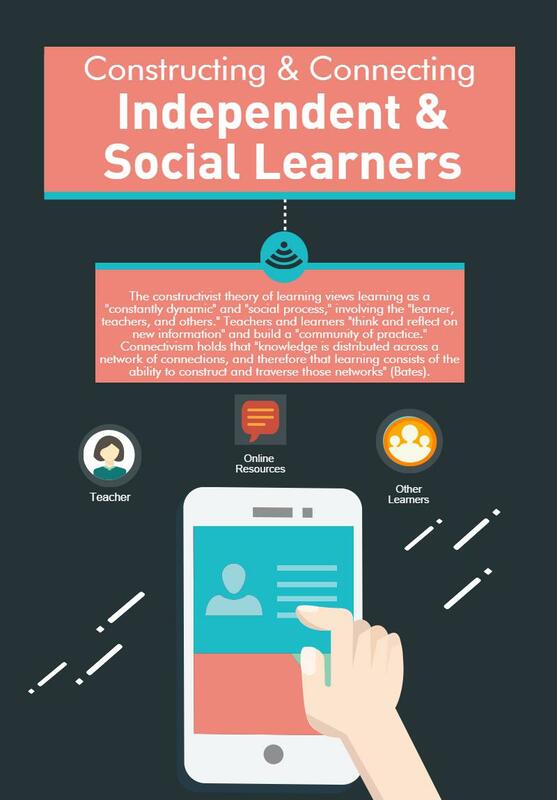 Communities of practice will be the chosen environments of constant learners who seek a social environment in which to learn and share. We need to coach our students through the process of using technology to set up and maintain their own communities of practice. annotation, Big 6, citation, community of practice, connectivism, constructivism, digital information management tools, Diigo, Easybib, EDTC 6102, inquiry-based learning, ISTE Student Standard 2, ISTE Student Standard 3, ISTE Student Standard 6, ISTE Student Standards, networking, peer editing, writing process. Bookmark.